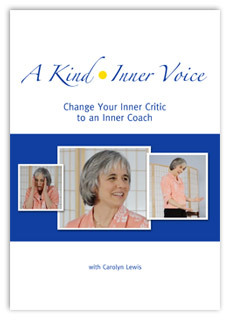 Join Carolyn Lewis in an inspiring Kind Inner Voice workshop and change your inner critic to an inner coach. This step-by-step process blends theory with engaging interactive techniques that will help you to be happier, more effective and more productive in your life. The goal setting portion of the workshop also guides you in using the KIV process to get better results in reaching your personal goals, from habits or health to career, relationships and so much more. Discounts for volume purchases will appear in your cart on a separate line item.